THE LEGUMES OF ARIZONA PROJECT. The Desert Legume Program, a joint project of the Boyce Thompson Arboretum and the University of Arizona College of Agriculture and Life Sciences is developing a reference book that will describe the Legume Family (Fabaceae) in Arizona. 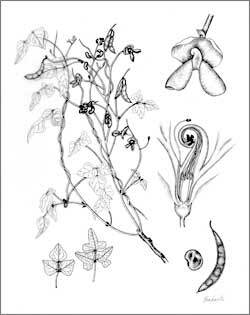 Legumes of Arizona, an Illustrated Flora and Reference will include descriptions of all legume species found in Arizona -- native, naturalized and cultivated. Information on their historical and potential uses will be included as well as horticultural information for cultivated species. These plants are particularly significant in Arizona as many species are adapted to arid lands, and desert-adapted plants will become increasingly important as water issues of the state become more critical. Despite this family’s significance, there is no comprehensive reference for these plants in the United States or for Arizona. Publication of the book is expected in late 2018. More information about the Legumes of Arizona project is available here, and information on the Desert Legume Program can be found here. BOTANICAL ILLUSTRATIONS. Illustrations will be an integral part of this work and represent not only accurate scientific representations of these plants, but unique works of art. They can be used as a tool for identification, providing readers with a visual representation of the unique characteristics of the species. In order to create the necessary detail for this type of illustration, the artist must carefully study the plant, often using a microscope to look at important details. Artists also strive to show the beauty of the plant. This is reflected in the artist's use of a variety of lines and in the composition of the botanical plate: the layout of the stem, fruit, flower, and other identifying characteristic parts of the plant. You can read more here about the process of creating a botanical illustration. LEGUME ILLUSTRATIONS ON EXHIBIT. Many of the illustrations for Legumes of Arizona are being done by contemporary botanical artists, and a number of completed illustrations have been exhibited at the Boyce Thompson Arboretum and the University of Arizona. Photos from those exhibits can be seen here. Here is a sampling of the illustrations drawn by these artists.